Lake Ontario has always been an incomparable natural resource and with the help of Enwave’s expertise and innovation, Toronto’s downtown core and now 250 Yonge Street are directly benefiting from a game-changing process called Deep Lake Water Cooling (DLWC). The strategic collaboration between Enwave, the City of Toronto and various property owners has enabled the City’s downtown core to embrace an alternative to conventional, energy-intensive air conditioning. Enwave’s environmentally friendly and cost-effective DLWC is the world’s largest lake-source cooling system. Our winters can be cold, resulting in the surface water of Lake Ontario to drop to about 4° C. Chilling causes the density of water to increase, causing it to sink to the bottom of the lake. During the summer months, as surface water heats up, due to its lesser density, it remains at the surface. But regardless of how hot the summer, the deep water remains very cold, creating a permanent reservoir of cold water on the bottom of Lake Ontario. Going Deep and Cold “Enwave positioned three high-density polyethylene (HDPE) pipes along the natural slope of the lake bottom to pump water from a depth of 83 meters and transport it to the Toronto Island Filtration Plant. There, the cold water is processed, then directed to Enwave’s Energy Transfer Station at the city’s John Street Pumping Station. At this stage, heat exchangers facilitate an energy transfer between the cold lake water and Enwave’s closed chilled water supply loop. Once the energy transfer process is complete, the lake water continues on its path to the city’s potable water system. 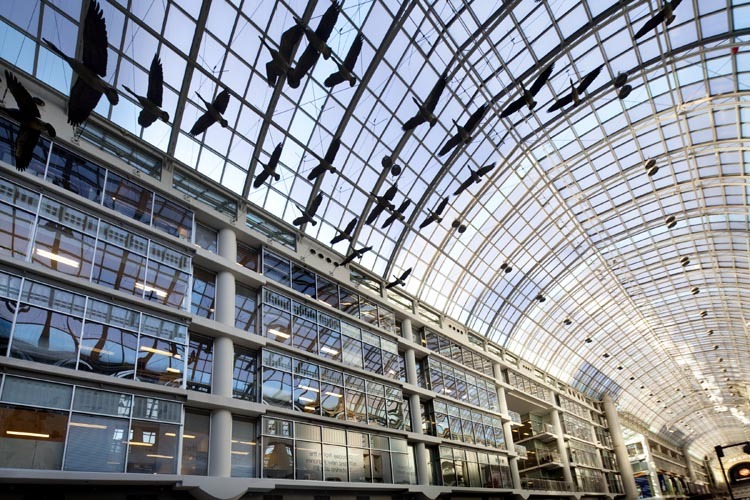 Only the coldness of the lake water is harnessed, rather than the water itself.” Enwave.ca Cadillac Fairview’s Toronto-Dominion Centre has been an Enwave partner for over a decade and the benefits from cost to clean have been enormous. 250 Yonge Street is the first CF TEC office property to convert to Enwave’s DLWC.